The subsidiary has overtaken the parent company, as a new study from Piper Jaffray found that the most important social network for teens in the spring of 2014 is Instagram, which passed both Facebook and Twitter to claim the top spot. According to the study of 7,500 teens with an average age of 16.4 years, the top three social networks in terms of importance for the spring of 2014 were, respectively, Instagram, Twitter, and Facebook. 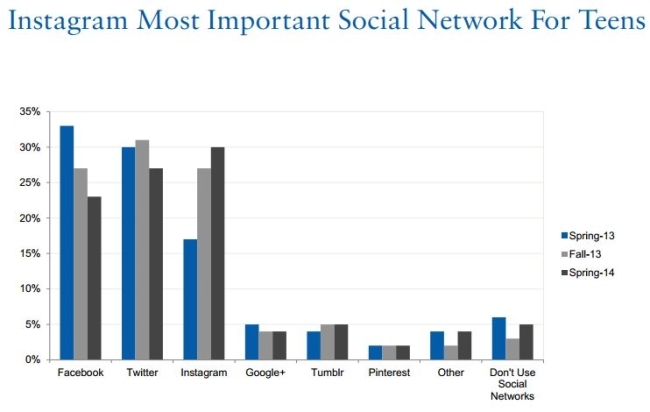 In the fall of 2013, Twitter was the most important social network, with Facebook and Instagram tied for second place. Facebook was tops in the spring of 2013, followed by Twitter and Instagram. Readers: Were you surprised by the results of Piper Jaffray’s study?